“I believe that if The Rev. 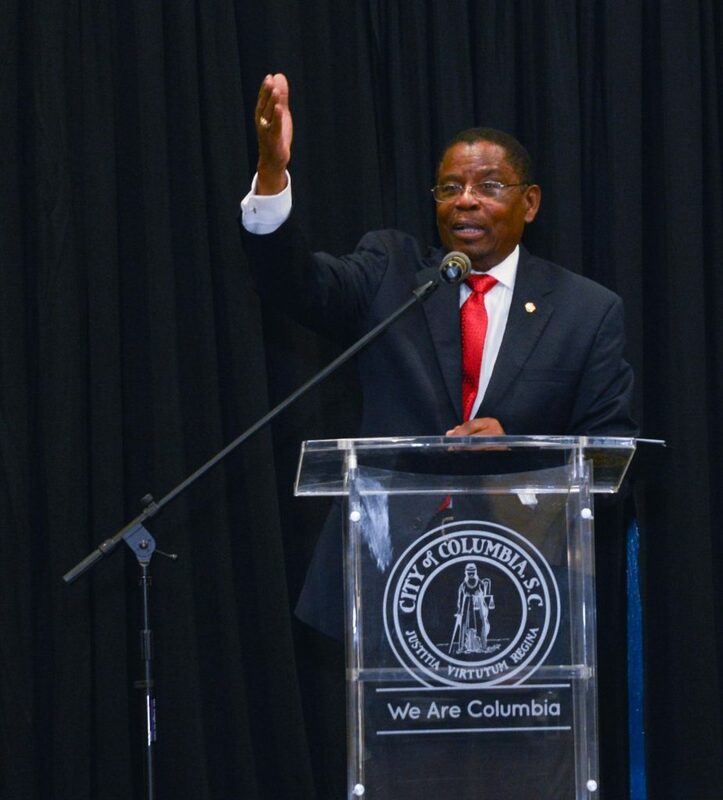 Dr. Martin Luther King, were here today, he’d be very disappointed in the lack of real change in America as it relates to racial and economic justice,” said Claflin President Henry Tisdale in his keynote message Monday (Jan. 16) at the city of Columbia’s 2017 Martin Luther King Day Celebration. Tisdale challenged America to live up to its promise and Dr. King’s dream of becoming the land of equality and inclusion to all of its citizens regardless of race or gender. During his speech, which Tisdale titled “A Tale of Two Cities — The Other America,” Tisdale posed the question “What would Dr. King think or say if he was with us today? Tisdale made his remarks to an enthusiastic and perceptive audience at the Durham E. Carter Community Center at Martin Luther King Jr. Park. The capacity crowd included Mayor Stephen Benjamin and a host of elected officials and civic and religious leaders. Henri Baskins, chair of the Martin Luther King Jr. Memorial Foundation Committee, was the mistress of ceremony for the event which featured performances by Claflin’s Concert Choir and the Lower Richland High School Diamond Singers. Tisdale cited many of the problems faced by America’s minorities back in the 1960’s still exist such as the ability to secure decent housing, equal salaries, quality health care, social justice and equality, and equal political influence and representation. “When will the dream be fulfilled? That’s what Dr. King would ask,” said Tisdale. Tisdale told the audience that King’s “I Have a Dream Speech” in Washington in 1963 is perhaps his most referenced speech. However, he pointed out that King gave a speech at Stanford University in 1967 that best affirms him as a true visionary and validates his legacy. Tisdale believes that Dr. King “went off script” in the speech and talked about the Vietnam War and how the war was diverting attention and resources from the Civil Rights Movement and the Great Society program designed to eliminate poverty. Tisdale listed how the nation’s leaders have failed to erase class division, mass incarceration of African-American men and women, expanded wealth gap between white and black households, and inequality in education. However, he also highlighted the seminal achievements of blacks, women and other minorities since Dr. King’s speech 50 years ago, culminating with Barack Obama being elected the 44th President of the United States.